This is my 21st installment of Babywearing Stories 365. Each installment features a babywearer in 1 photograph and their answers to 5 questions. My goal is to normalize, promote and celebrate daily Babywearing, moving beyond *what* we use to carry our babies and shifting focus back on *why* and *where* we carry. I hope to share the stories of moms, dads, and babywearing caregivers all over the world. Enjoy! This is a picture of me (Sandi) carrying my five months old daughter, Madison. We are with my husband (Steve) and my mother about to take a walk on the beach. I am using an Ergobaby carrier. I use the Ergo daily for carrying Maddie while walking and hiking. 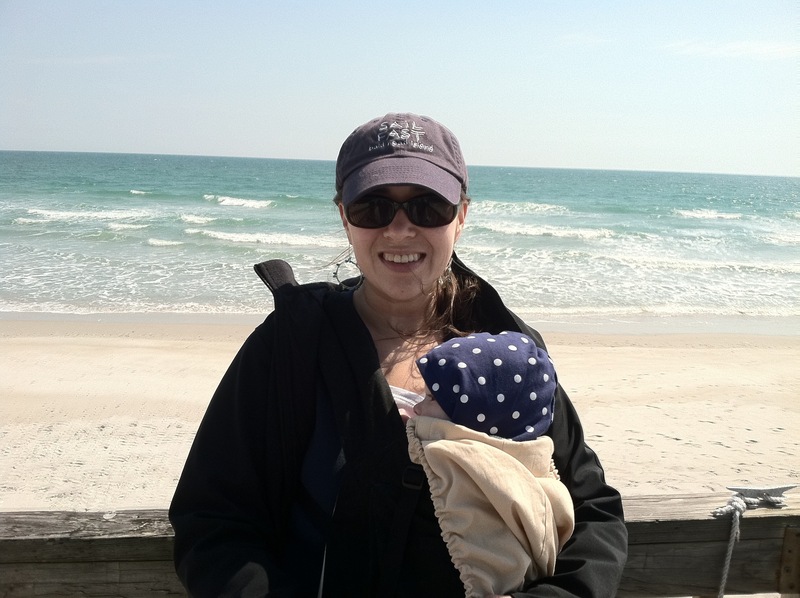 On this beach walk, the Ergo provided a wonderful shield from the ocean breeze and the swaying movement of our walk put Maddie at a needed rest to recharge for play time with Grandma. Madison is five months and still prefers napping on me, so the Ergo allows her to nap and gives me the ability to be active. My husband and I love the Ergo when we are hiking, and my husband will usually wear Maddie. I believe baby wearing provides a closeness to your child and convenience in mobility that cannot be achieved while pushing a stroller. I also use the moby at home to accomplish chores while Maddie is awake. She enjoys being involved in my activities, and I am able to keep her entertained while gaining the use of both my hands.